I'm sure everyone is familiar with GUESS by now, & so far on my blog I've already featured them twice previously! This time, GUESS Watches provided 3 pieces from their latest Fall 13 collection for me to match accordingly with 3 different outfit occasions - Casual, Workwear & Party! I'll be showing you how no matter the occasion, there'll be a GUESS watch suitable! These are the 3 watches I'll be featuring in this post! Top to Bottom: Untamed, Viva in Silver & Mini Phantom in Gold/Silver! Below are some of their other pieces however, & they come in many other quirky designs! My favourite among these 3 would be the Jet Setter one! I'm not really into diamante/sparkly designs for watches so the Jet Setter one is a perfect mix of casual & unique for me! I love the unusual rose-gold colour as well (which is pretty uncommon) & think it comes together surprisingly well with the denim! The denim watch comes in men's style as well, which would be suitable for boyfriends! The Time to Give watch is actually a limited edition design that's part of GUESS' philanthropic efforts, which has so far seen USD$4.5 million donated to 7 charities! Part of the proceeds from the Time to Give watch will be donated to "Faces to Watch, Time to Give", which is program to benefit children worldwide. Tea Rose is a really outstanding piece with a floral design! This is great for days where you're looking to inject a bit of colour into your outfit while still keeping it formal & classic! 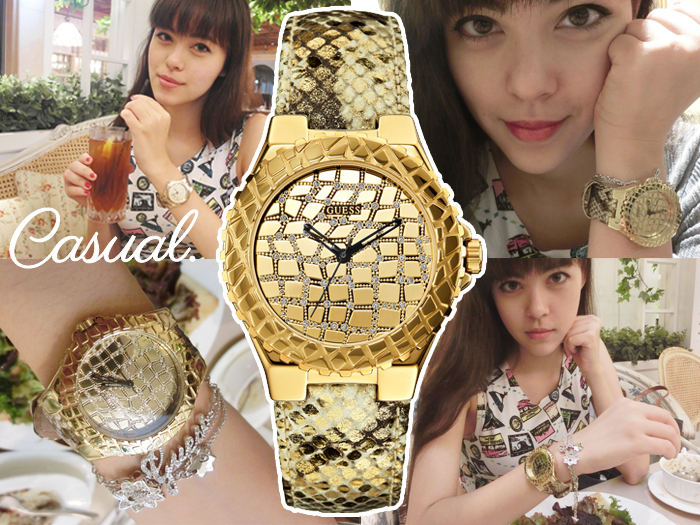 I picked the gold Untamed watch as my Casual piece! Some may say it looks more party-ish but I personally prefer leather straps to metal chain-links so I would always pick a leather strap watch as my go-to one! Hence it's my pick for Casual outfits which can be worn on a daily basis. The Untamed piece is very easy to match! I like that it has a simple watch face (no numerals/diamonds/etc) but is still unique due to its python-style print. Closer look at the python design, & matched with 2 GUESS Jewellry pieces! For Work I felt a classic silver watch was the most suitable, & hence the Viva! Here it is paired with 2 silver GUESS Jewellry! The 2 silver bracelets easily match the watch, which mixes sport & glitz through the crystals encrusted around the watch face! This keeps the watch looking feminine & you can easily layer on dainty charm bracelets like above to further accessorize it. The silver colour scheme keeps it simple & classic while the crystals mix things up a bit! The silver Viva watch is really easy to match! Its classic design means that it goes well with formal outfits & various colors. The design is kept simple so you can still accessorize it, such as with the 2 dainty GUESS charm bracelets I've used above, or with something chunkier & bolder! And last but not least, I felt the mix of gold & silver on the Mini Phantom was more suitable for party/night occasions! The metal chain-link makes it more formal, but the combination of gold & silver keeps it playful! I also like that it's fairly simple so you can layer it with a lot of bracelets/rings if that's your thing! This watch is a new take on men's watches, fusing sports-watch elements with sophisticated feminine features to produce the perfect mix of both worlds for the modern girl! 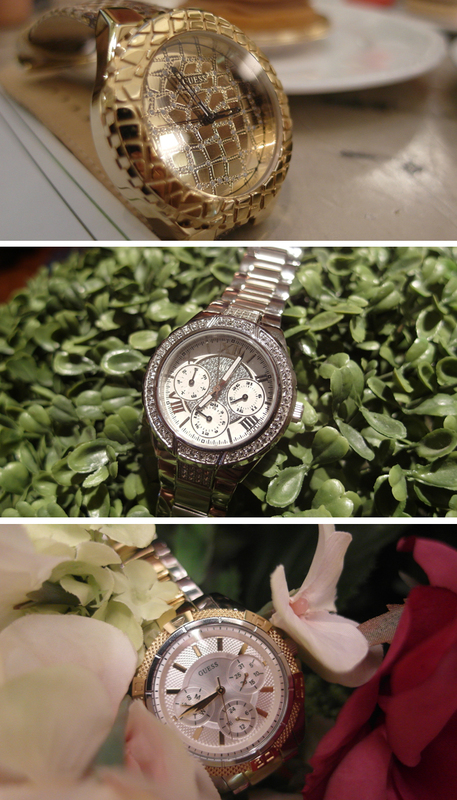 Here is the watch paired with 2 gold pieces from GUESS Jewellry! Ok enough of my rambling, I'm sure you want to know how YOU can get involved! First up is the GUESS Roadshow at VivoCity Atrium! You'll see the showcase of the GUESS Fall 13 watch collection & get to enjoy exclusive promotions! I'll be there along with Beatrice, Qiuting & Rachell! LOLOLOL. Ok fine. There's a contest & freebies! 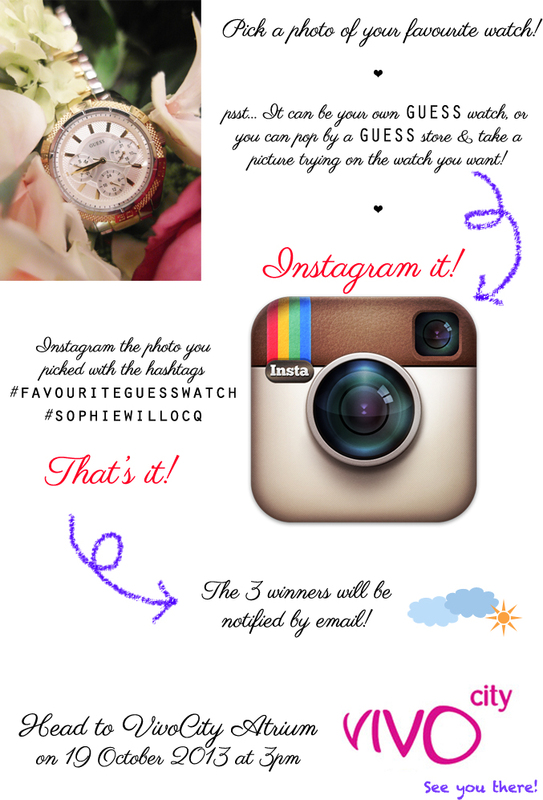 All you need to do to qualify is to Instagram a photo of your favorite GUESS watch. 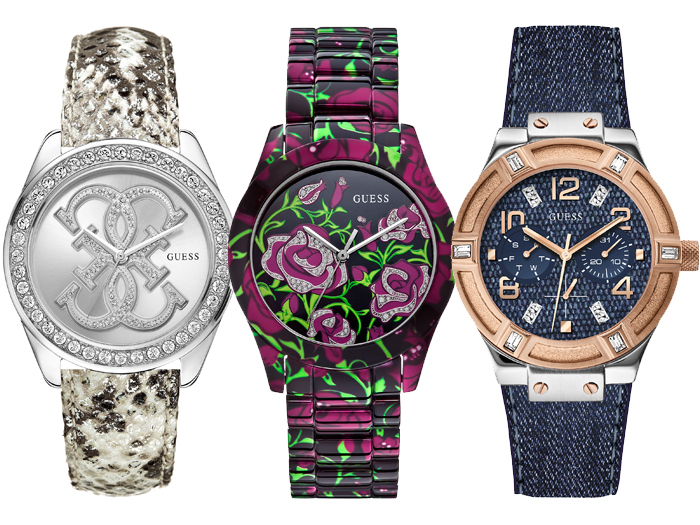 Pop by a GUESS store to check out their new watch collection & decide which you would want to win! Be careful with the spelling of "favourite" ok.
Haha if you spell it as #favoriteguesswatch your entry might get overlooked! Open 13 September 2013 - 27 October 2013 so don't wait too long! And not to worry, even if you don't win a watch... 50 of you will also get a limited edition GUESS denim tote bag for free! Simply be the first 50 to RSVP your details at the HERE for the 19th October, 3pm roadshow & you'll receive the bag! This is the denim tote bag! Very easy to match & of a good size! GUESS is also running promotions from 13 September 2013 - 27 October 2013! To qualify for the discounts, simply quote my name! :D Very simple! So will your watch be for Casual, Work or Play? Check out the GUESS Watches Fall 13 TVC below! 5 comments on "GUESS Watches"